One of my pro-regime relatives has recently joined a group on Facebook called the "Algerian-Syrian Electronic Alliance". 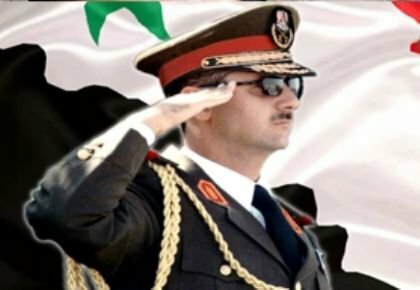 Apparently the group is there to coordinate the online efforts of the supporters of two fascist regimes, the generals of Algeria with the Assad regime in Syria. Apparently they warn other members of the dangerous channels (Al Jazeera and Al Arabiyah) on the air that spread "lies about their countries". Apart from the worry I have that I'm related to such morons, I despair that there are enough people out there who are stupid enough to think that dictatorship and corrupt authoritarianism are acceptable ways to govern a country. This one is supposed to show the immortal leader as good with children (his future subjects). The message is that he's nice, friendly, approachable and a father figure. I call this one the philosopher/king photo-op. The translation to the phrase is "God, Syria, My People and that's it". His thoughtful pose in the background shows that he is a wise ruler, with a great burden on his shoulders. The waving, smiling face at the front is important to maintain the approachability of this great man. The slogan here is "And have you asked why they call him the Lion of the Arabs?" 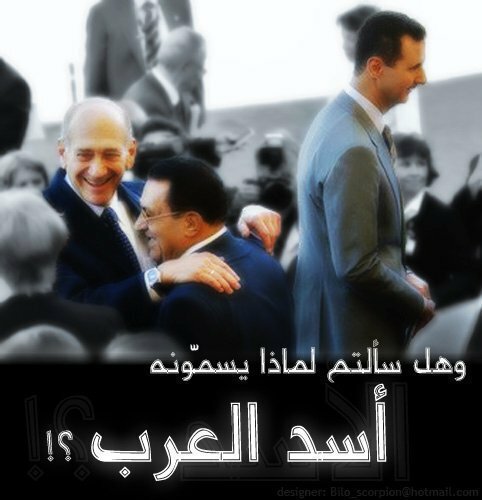 It's supposed to show that whilst Mubarak is selling out to the Zionist enemy, Assad is turning his back to them. Conveniently ignored is the fact that the Syrian regime believes that stability in Israel depends on stability in Syria, or that Assad looks like he is searching for the lavatories. This one is a bit simplistic, and it looks like it was designed by a twelve year old boy. 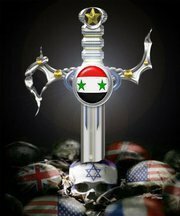 A sword with the Syrian flag as an emblem is embedded into a zionist skull. 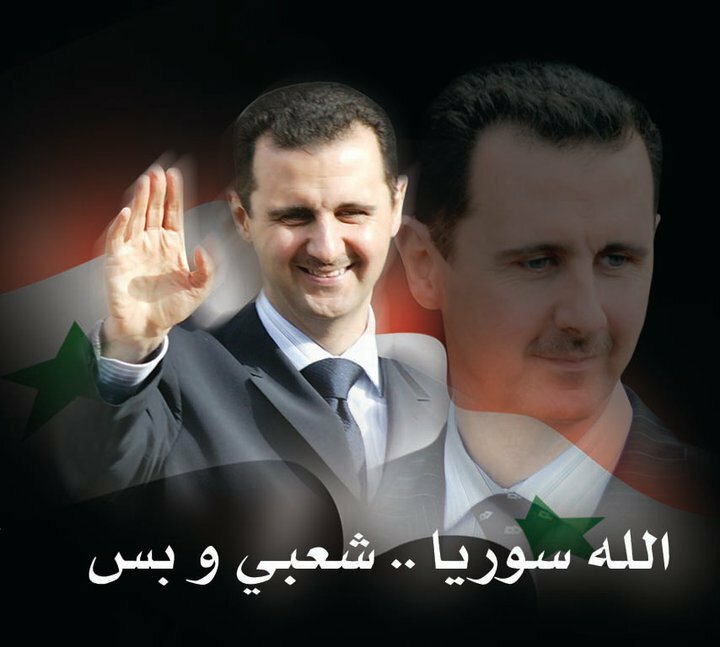 Oooh, beware, enemies of Syria...from the twelve year old boy and his photoshop skills. This is one of the photos that a retarded pro-regime cousin of mine allegedly paid two hundred dollars to obtain. 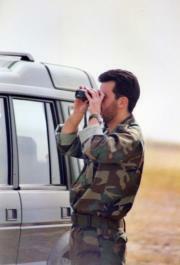 Original and authentic photos of the glorious leader's brother, Maher, on some military exercise. I don't think it's the Golan Heights that he's looking at. Here is the Generalissimo himself. My Latin American readers would find such pictures very familiar. As long as they were alive long enough to remember the fifties and sixties. This one aims at showing the family man. It says "We are with you. We are all Bashar and Asma al Assad. We are all for you oh nation." 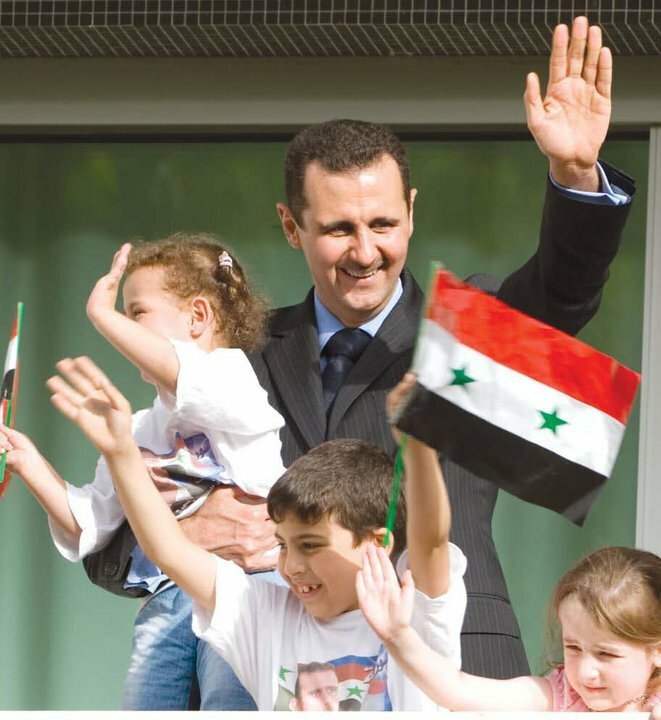 These pictures are from the famous visit that Syria's royal family had to Paris a few years back. The designer clothes, the expensive restaurants. Perfect photo-opportunities. Lovely. We've had our differences before but I find myself very inclined to LIKE YOU a lot in recent months. Great post. I admire your courage and that of your people my friend. Thank you both. And thanks for your support. Love this. I am sharing on fb and on my blog.